The HomePod is much smaller than I remember. I hadn’t seen one since June, when the company announced the speaker back at WWDC. 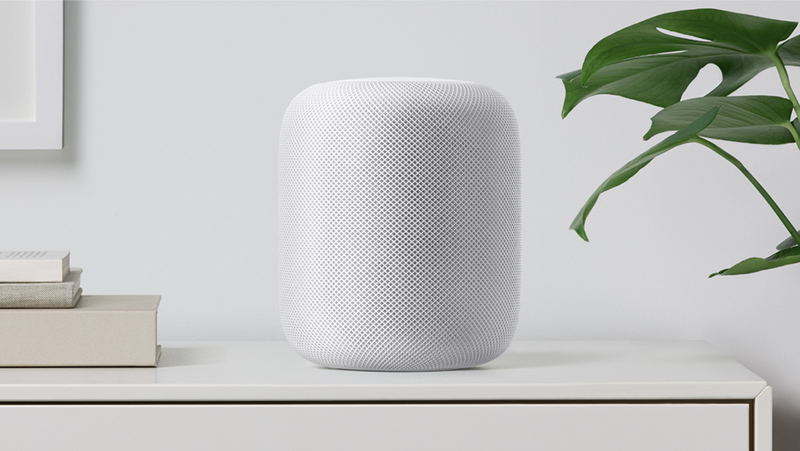 Last month, of course, Apple announced the speaker was being pushed back from its projected December launch date because the company needed, “a little more time.” That time, it seems, has finally arrived, going up for pre-order this week and shipping on February 9. I spent a bit more time with the smart speaker this week in its final production form, and was surprised by how small the thing is, at seven inches. Maybe it’s all that time I’ve been spending with Google’s massive 12-pound Home Max Speaker. The company diagrammed the internals a bit during launch. 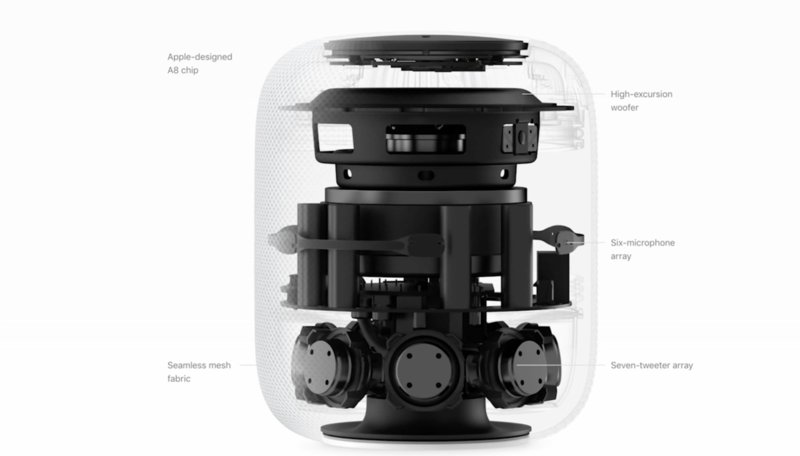 There’s a ring of seven tweeters around the bottom of the system, with a large woofer up top — which is able to move up to 22 millimeters, a sizable travel given the HomePod’s relatively small size. One of the big things the design offers over the Home Max specifically is that 360-degree design, which again, does a surprisingly good job offering consistent coverage in different spots of a room. When I met with Google ahead of the Max launch, the company explained it had opted for a single directional design given the fact that most people end up placing their speakers against a wall. The company uses that positioning to offer what it’s branded “Smart Sound” — essentially the speaker’s ability to adapt its sound quality based on its proximity to the wall. After all, so much of what we hear from a speaker is what’s reflected back at us. It automatically analyzes the acoustics, adjusts the sound based on the speaker’s location, and separates the music into direct and ambient sound. Direct sound is beamed to the middle of the room, while ambient sound is diffused into left and right channels and bounced off the wall. So your music sounds amazing, wherever you are in the room. In essence, it seems to be using the on-board microphones to create locational awareness based on the sounds that are reflected back at it. From there, it paints a picture of the room around it and serves up sound accordingly. In the case of the Home Max, the system gradually adjusts the sound to accommodate its surroundings, so there isn’t a sudden shift in quality. I didn’t have time to futz about with the feature on the HomePod, but I imagine it executes in a similar fashion. So it sounds great — it’s nice to look at, too, with a cloth cover that comes in either white or a dark gray. The top features two volume touch buttons. When the HomePod is listening and thinking, you get a colorful circle of light representing that ethereal sense of intangibility that is Siri — which, of course, brings us to the other part of the whole smart speaker experience. This is, of course, Apple’s answer to the Echo and Home, and Siri is an integral part of that experience. The company seems unlikely to open its smart assistant to third-party hardware any time soon (lest it risk delivering something less than its customary hardware/software symbiosis), so HomePod is really the definitive Siri smart home experience for the foreseeable future. Apple’s approach also means that you need an iPhone, iPad or iPod touch to get set up with the speaker (it works in tandem with Apple TV, but the set-top box can’t be used to get up and running). One of the upsides of that limited offering is an extremely streamlined setup experience. It’s really similar to pairing Apple’s AirPods, with a dialogue box that pops up on the mobile device. From there, you choose which room you’ll be putting it in, enable Siri and opt into personal requests. That last bit involves using the speaker to offer up things like notifications. At present, the HomePod isn’t capable of differentiating users based on voice, so things can’t be personalized to that degree. The workaround the company has come up with for dealing with this is only enabling that functionality when the device detects that the mobile device used to set it up is present. In terms of privacy here, like Echo and Home, the six on-board microphones are listening for their wake words (“Hey Siri”) and only send info to the server once that is invoked. That information is encrypted and kept anonymous, so there’s no central repository for your Siri requests. Also, unlike Amazon and Google, there’s no running tally of those requests in a centralized Siri app. There’s no visual cue for this, like the red ring that lights up on Echo devices. There’s no physical button, either. When you want Siri to start listening again, you either can re-enable the feature in Home or activate Siri by touching the top of the HomePod. Siri does appear to listen pretty well when it’s enabled — even when music’s playing. No word on whether there will be something akin to Amazon’s near-field tech on-board when the company rolls out multiple speaker pairing as a free update later this year. If I were the betting sort, I’d say expect some news on that front sometime around WWDC. The smart assistant’s functionality on the device is going to be somewhat limited at launch — not surprising, since Amazon and Google have a pretty healthy head start here. Apple was focused on what it saw as the key things folks actually use these devices for. Music is the number one spot, of course. Also on board are weather, traffic, directions and news. That last bit, as reported, is accomplished through access to podcasts. Here in the States, the device defaults to NPR, but you can switch that setting to Fox News, among others, because where people get their news has become even more polarizing than the mobile operating system they use. There’s also calling functionality on-board. This operates differently than the Echo, however. It actually needs to be initiated on an iPhone and then handed off to the HomePod. That means the phone needs to be present. Smart home functionality is pretty robust here, courtesy of all the work Apple’s been doing on the HomeKit side of things. And all of that is aggregated into the Home app. There’s also no need for a separate smart home hub here, which is nice. The company’s made a point to keep much of the functionality in the Apple family here. That’s actually clearest on the music side of things. If you want full music playback functionality, you’ll need Apple Music (which Siri will happily offer up as a free three-month trial on setup). The only way to use something like Spotify is through AirPlay on a connected smartphone (there’s no Aux input on the back, either). That’s going to be a sticking point for many users, of course. Hard to say if third-party music streaming will be coming down the road, but this all seems to be part of Apple’s focus on offering a unified end-to-end experience with the product. The plus side of such integration is a depth of functionality. For example, you can ask Siri for contextual information on a song or artist while listening through Apple Music using commands like “Hey Siri, when was this song released?” or “Hey Siri, tell me about Husker Du.” That information is pulled from a variety of sources, including Apple Music’s own metadata and places like Wikipedia. I admittedly only had a short time with the speaker, so I’ll save any final thoughts for now. What is clear, however, is that the HomePod is a very Apple take on the category. It’s a nice-looking, premium device with really good sound at an admittedly high $349 price point (though, notably, still $50 less than the Google Max). Apple’s clearly offering a unified end to end experience for its first Siri-focused product, eschewing some broader functionality for the sake of a streamlined, unified experience.